Fat Burning Machine – Get Me Lean! >> Fat Burning Machine – Get Me Lean! I bought a Gymboss Interval Timer, which is the best piece of equipment to use for my workouts, as it’s has really helped me to accelerate my fat burning efforts! Because it controls the timing and pace throughout the workout it allows me to be fully committed to put in maximum effort from start to finish, just genius! This workout does what it says, it will provide the intensity to get me lean. It is High Intensity Interval Training (HIIT), 45 secs max effort followed by 15 secs rest for 2 intervals per exercise, and 8 exercises. So the beauty of this workout is that it’s 16mins long. You’ll see from the video that it’s not easy by any means, but it’s over before you know it – that’s my ideal workout. 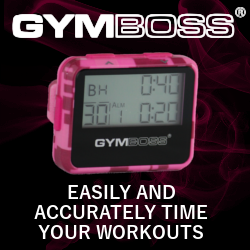 The Gymboss Interval Timer can also be a stop watch. You can set the intervals for different times depending on the workout. I’m just so happy I got it because I’ve found I probably rest too long between exercises in my other workouts, so I will definitely be including more HIIT into my workouts. As I said this workout requires 2 intervals to be set on your timer (start with the rest period as you then have time to set up for the first exercise). Set 15 secs rest, 45 secs effort and set it for 16 cycles. Each exercise will be performed twice and try and write down how many reps you manage in the 45 seconds in order to measure your progress. Beauty in the Barbell – Strength and Conditioning Workout!